Public-use data, which constitute the majority of ICPSR’s holdings, are those for which disclosure risk to research participants and of confidential information is minimal. When necessary, ICPSR protects respondent confidentiality by removing, masking, and/or collapsing variables in the deposited data to produce a public-use version of the dataset. Restricted-use data are distributed in cases when removing potentially identifying information would significantly impair the analytic potential of the data, or in cases where data contain highly sensitive personal information and cannot be shared as a public-use file. In these circumstances, ICPSR provides access to a restricted-use version that retains the confidential data but requires controlled conditions for accessing them. Access is only granted following an application process during which researchers agree to follow strict legal and electronic requirements for maintaining data confidentiality. The sections below provide further information on locating, applying for, and accessing restricted data at ICPSR. Secure Download: Upon approval, researchers will receive an encrypted file via e-mail which they may download to the secure location specified in the application. Virtual Data Enclave (VDE): Rather than receiving a downloadable copy of the data, researchers are approved to access the data, stored on ICPSR’s servers, via a remote desktop connection. Researchers are unable to move files from the remote desktop to their own desktop or to the Internet. To receive output from the VDE, researchers must request that ICPSR conduct a disclosure review on the desired files. Physical Data Enclave (PDE): The physical data enclave is located onsite at ICPSR’s offices in Ann Arbor, MI. Data in the physical enclave typically contain highly sensitive personal information or data from protected populations. To analyze data located in the Physical Enclave, researchers must travel to ICPSR. To receive output, researchers must request that ICPSR conduct a disclosure review on the desired files. Restricted Survey Documentation and Analysis (SDA): Researchers apply to analyze the data online via the Survey Documentation and Analysis (SDA) system. The online analysis system has built-in disclosure protection parameters for restricted data. Generally, the method of dissemination is related to the level of disclosure risk or the sensitivity of the data. Each dissemination method has a different application process and requirements. Restricted datasets are unavailable for immediate download; rather, it is only possible to download codebooks and other study documentation. Researchers are encouraged to review the documentation to become familiar with the restricted data before applying for access. To gain access to restricted data, researchers must submit an application, which can be found by clicking the “Access Restricted Data” button on the study home page and following the on-screen prompts. View all ICPSR studies containing restricted data. Investigator information: Includes name, contact information, and institutional affiliation of the principle investigator. In most cases, the principle investigator must have a Ph.D., J.D., or M.D. degree and be affiliated with an academic or research institution. Research staff information: Includes name, contact information, institutional affiliation, and computer make and model of all research staff members who will access the data. All research staff members must be affiliated with the same institution as the Investigator. Research description: Applicants will submit a research description which includes a description of the research project that the data will be used for and clear information about why these specific data are being requested. If multiple restricted studies or series are being requested, applicants should explain why each study or series is required. Confidential Data Security Plan: Applicants will select a confidential data security plan and agree to all terms included therein. The fundamental goals of this plan are to ensure that the restricted data are stored securely and are accessible only to the people listed in the application. ICPSR offers three confidential data security plans for secure download data: External hard drive, non-networked computer, and private-networked computer. IRB approval or exemption: Applicants must provide documentation of IRB approval or exemption for the proposed research project. Other requirements: Some restricted data have additional requirements, such as obtaining special certifications or filling out additional forms. Confidential Data Security Plan: Applicants are not required to select a data security plan, but rather must agree and adhere to the security terms found in the Restricted Data Use Agreement. Other requirements: Applicants must submit CVs for all researchers who will need access to the data for the proposed research project. Application requirements for restricted SDA data are mostly the same as those for Secure Download, with some exceptions, which are outlined in the online application. After an application is submitted, it is reviewed by ICPSR staff. The amount of time it takes to review an application depends on whether and how many changes are required before approval. ICPSR staff will work with the requester until all required information is provided and the request can be approved. Generally, it takes 2-4 weeks for an application to be approved after it is submitted. Can I collaborate with researchers at other institutions? In most cases, all researchers listed on a single application must be affiliated with the same institution. For collaboration across institutions, researchers from each institution much submit separate applications to access the restricted data. In their research descriptions, the Investigators for each request should mention that they are collaborating with researchers at the other institution(s) so that ICPSR staff can process the applications together. Data files and data subsets may NOT be shared between individuals at different institutions, even if all parties have received ICPSR approval to access the data. I am a student. Can I gain access to restricted data? In most cases, students may gain access to restricted data only if they have a faculty sponsor acting as the Investigator on the application. The faculty sponsor is responsible for overseeing the student’s proper use of the restricted data. I am not affiliated with an academic or research institution. Can I gain access to restricted data? In some cases, journalists, government employees, and others may be able to gain access to restricted data. Please send an inquiry to ICPSR-help@umich.edu to find out if this applies to your circumstances. In most cases, self-employed individuals or others with no institutional affiliation cannot gain access to restricted data. Do I need to be affiliated with an ICPSR member institution to access restricted data? Is there a fee for accessing restricted data? 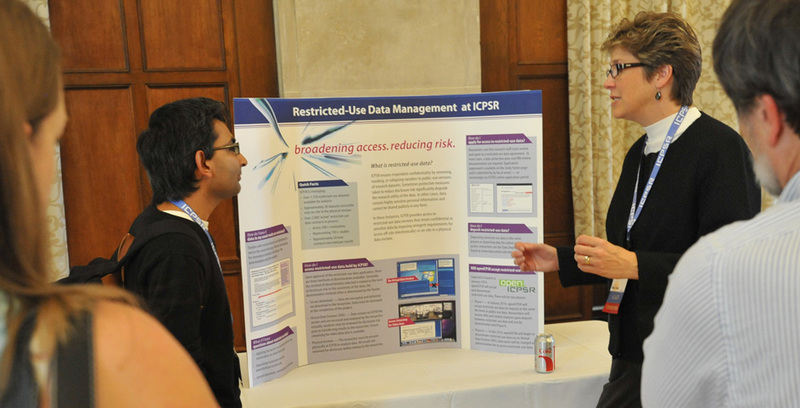 The majority of restricted data at ICPSR are federally funded and do not have an access fee, but some studies do have fees. If a study has an access fee, this information will be displayed within the application.